It is not difficult to understand why the Lib Dems are so unpopular. They made a huge fuss about tuition fees and how they would vote before the last election. In fact, it was one of the main reasons they attracted votes in university cities like Cambridge. They didn’t just have a policy on the issue, they “pledged”. Like a promise I guess. 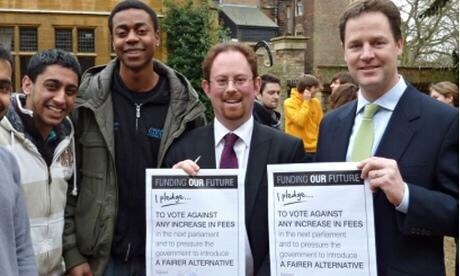 As a party they chose to vote for tuition fees despite making a promise to the electorate. How can anyone trust a party that will do anything to get elected then do just as they want afterwards? Always good to check the facts before putting pen to paper. Huppert was a rebel and voted against increasing fees!